DOCTOR WHO - Is it possible to enjoy DIMENSIONS IN TIME? | Warped Factor - Words in the Key of Geek. DOCTOR WHO - Is it possible to enjoy DIMENSIONS IN TIME? Geek Dave battles the weather and ends up getting reacquainted with the Doctor Who 30th anniversary special. Like many households across the country mine was hit by the recent bad weather. The rain came down, it didn't stop and the flooding soon began. We were quite lucky because the only real damage to our house was electrical and could all be sorted out, eventually. For us it was more of an inconvenience and potential worry of what could come. Thankfully it never did get any worse but my heart goes out to anyone who has suffered the extreme conditions and has had major damage to their property. Unfortunately my garage didn't get off so lightly. Some tools, nik-naks and kids toys all drowned in almost a foot of water, it's not the end of the world but along with them were 3 boxes of VHS videos that I'd collected in years gone by. By far the majority of tapes were Doctor Who stories, either ones I'd purchased in the 80s and 90s or episodes recorded off-air thanks to UK Gold. Just about all of them had been replaced on DVD, but it still made me sad to look at the sodden cover of The Brain Of Morbius and opening up the case of Day Of The Daleks to pour out about half a pint of water. Even my Trial Of A Timelord tin box set had not withstood the rain, the card cases inside fell apart as I tried to lift them out. I know people have lost their homes, and it's clearly nothing like that, but it was emotional. Almost as if to add insult to injury, the top layer of tapes in one of the boxes was absolutely fine. That consisted of the first series of Men Behaving Badly (the worst series, with Harry Enfield in), two Lovejoy videos and my off-air recording of the 1993 Doctor Who 30th Anniversary Children In Need Special, Dimensions In Time. There it sat, complete with the 3D glasses slipped inside the case. Of all the Doctor Who episodes that survived it was this one! I think I only ever re-watched it once, about 10 years ago, and only because I couldn't quite believe it was as bad as I remembered it to be. But it was! Just imagine if some terrible ecological disaster happened to the planet, wiping us all out, and thousands of years later aliens land wanting to discover more about the people who inhabited this strange world. Clearly my garage would be their first port of call, where they would discover recordings of the things we'd watch for entertainment. What the bloody hell would they think when viewing Dimensions In Time? Fun fact: Dimensions In Time is in fact canon! In the Doctor Who novel First Frontier, the Seventh Doctor says, "I once had [a nightmare] where all my old foes chased me round a soap opera." You can excuse it as much as you like by saying "well, it was for charity", but that doesn't cut it with me. It was crap! 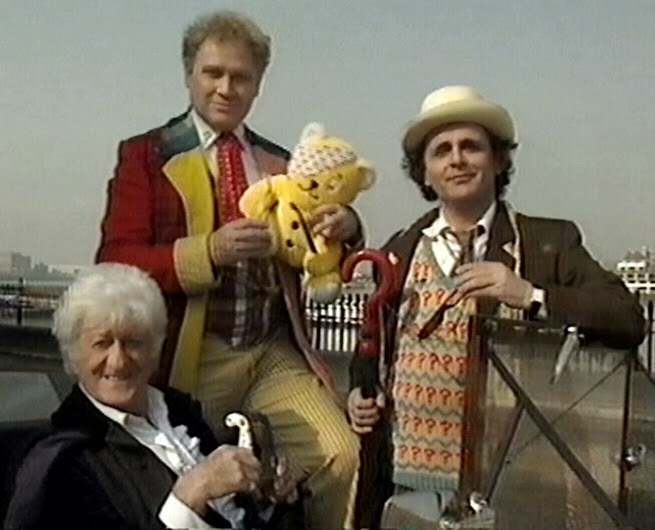 Saying that, in many ways Dimensions In Time was the perfect episode for the 30th anniversary because it completely sums up just what the BBC thought of the show at the time. They had treated it so badly for most of the previous decade and probably thought they were doing the show justice with this outing. Of course, it wasn't just the BBC. In the late 80s Doctor Who was thought of as a joke by most of the people that didn't watch it. Which was so unfair on Sylvester McCoy because those of us who were watching knew just how good season 25 and 26 had been. To make matters even sadder, almost 14 million people across the country watched Dimensions In Time when it was broadcast as part of Children In Need and Noel's 'bloody' House Party, making it one of the most watched Doctor Who stories ever. On watching it, it must've backed up exactly what the casual viewer thought of the show - it was a joke! What we should've got was the originally planned 30th Anniversary episode, Lost In The Dark Dimension, but instead we got a mish-mash of nonsense and the cast of EastEnders, propped up by Noel 'bloody' Edmonds! Because all the cast and crew worked for free on the production, there was an agreement that it would never be released commercially. Good job too! But with the rise of the home computer and the advent of YouTube, Doctor Who fans are now trying their best to make this show watchable. It's nice to see the unused footage, but it's still quite horrendous! I believe there really is only one way to watch Dimensions In Time, think of it the same way all those 'non-Whovians' thought about Doctor Who back in the 80s, think of it as a joke. So there you go, it is possible to enjoy Dimensions In Time. That version might not be up there with The Five(ish) Doctor's Reboot for laughs but it's certainly the one I would watch again...although not in a hurry!